Make a portable cloud in a bottle: Now you see it, now you don’t! Clouds form when invisible water vapor in the air cools enough to form tiny droplets of liquid water. In the atmosphere, this usually happens when moist air rises to higher altitudes. At higher altitudes, the pressure is lower, so the gas expands, loses internal energy, and cools. You can create the same effect by rapidly expanding the air in a jar. Barely cover the bottom of the jar with water. Stretch the glove’s open end over the mouth of the jar to seal it. Insert your hand partway into the glove and pull it quickly outward without disturbing the jar’s seal. Nothing will happen. Next, remove the glove, drop a lit match into the jar, and replace the glove. Pull outward on the glove once more. This time, notice that fog forms inside the jar when you pull the glove outward and disappears when the glove snaps back. The fog will form for 5 to 10 minutes before the smoke particles settle and have to be replenished. Water molecules are present in the air inside the jar, but they’re in the form of an invisible gas or vapor—moving around individually and not sticking to one another. 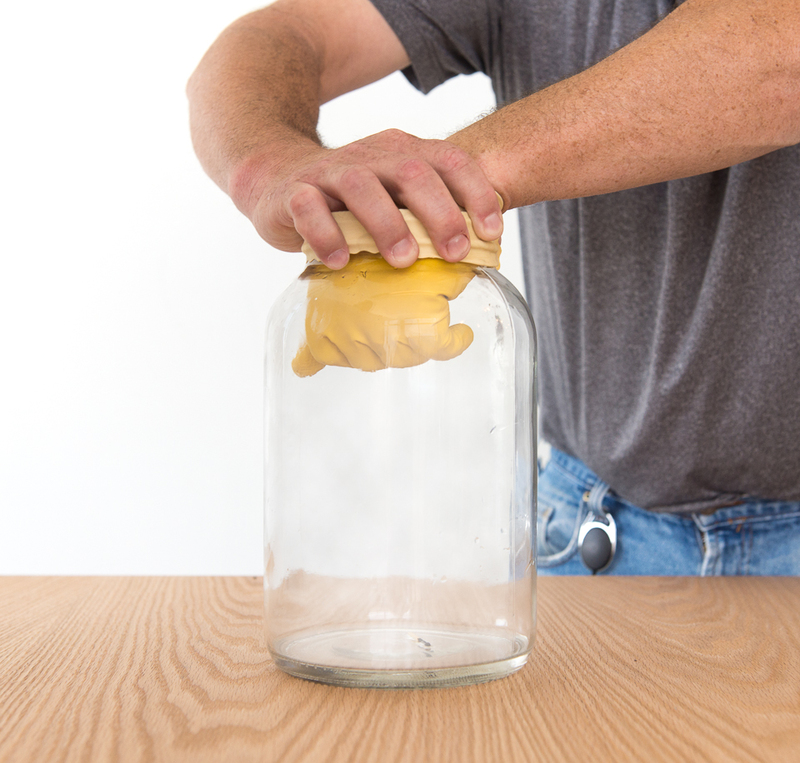 When you pull the glove outward, you allow the air in the jar to expand. In expanding, the air must do work, which means that it loses some of its thermal energy, which in turn means that its molecules (including those of the water vapor) slow down slightly. This is a roundabout way of saying that the air becomes cooler. When the water molecules slow down, they can stick to each other more easily, so they begin to bunch up in tiny droplets. The smoke particles from the match that you put in the jar help this process along: water molecules bunch together more easily when they find a solid particle to act as a nucleus. When you push the glove back in, you warm the air in the jar slightly, causing the tiny droplets to evaporate and again become invisible. In the atmosphere, air expands as it rises to regions of lower pressure and cools off, forming clouds. This is why clouds often obscure mountaintops. Dust, smoke, and salt particles in the air all provide nuclei that help the droplets condense. Meteorologists consider a falling barometer reading (low air pressure) to be a sign of an approaching storm, whereas high pressure is usually a sign of clear weather. The temperature at which water vapor begins to form droplets on a surface is called the dew point. For an added treat, shine the beam of a flashlight through the cloud you make in the jar. When the smoke is fresh, the droplets will be large compared to all wavelengths of visible light, and the light they scatter will be white. As the smoke dissipates, the water drops will become smaller, and the light scattered will create beautiful pastel colors at some viewing angles. Just spew it—build your own cyclic hot water fountain.